Background: A rational and well-developed pharmacological basis forms the foundation of therapeutics in Ayurveda. The principles and theories of Ayurveda need to be validated in the scientific context in order to harness the millennia old knowledge. Rasa (taste) of the substance is the foremost tool in Ayurveda to assess and determine the pharmacological properties and actions of the substance. Similarity in rasa is said to signify similar structure and consequently similar pharmacological behavior. Depending on skills developed over the course of long-term clinical experience one, can register the minute variations in rasa of substances and accordingly the possible variations in pharmacological actions. Thus, rasa can be used as a scientific tool in the drug discovery process to limit and focus the target areas. Aim: To sensitize scientific community to the utility of rasa as a tool in the process of drug discovery. Materials and Methods: All relevant ancient and contemporary literature was reviewed critically to form a scientific basis of the Ayurvedic concept of rasa as a tool to identify the pharmacological behavior of a substance. Conclusion: The review finds that rasa (taste) can be used as a guide to identify potential targets in drug discovery. The Ayurvedic understanding of physiology, pathology and pharmacology is subtle and holistic in nature. Dravyaguṇa, the Ayurvedic science of medicine in its all aspects, uses rasa (taste) of the substance as the primary tool to assess the pharmacological behavior of any substance. There are five concepts of the substance namely rasa (taste), gu0ṇa (properties), vīrya (potency), vipāka (rasa after digestion and metabolism) and prabhāva (specific pharmacological effect), which determine and explain the pharmacological behavior of a substance. These five principles are nothing but manifestations of five mahābhŪtas in specific states of activation. Therefore, these principles do indicate the structural and consequent activity of any substance. Normally, the clinical uses of medicinal plants described in Ayurveda are taken for drawing the leads. But, the authors believe that the fundamental principles of Ayurvedic pharmacology has more potential to offer solutions as Ayurveda has more in it than a collection of uses of plants or natural products. Ayurvedic principles like rasa can offer leads to possible pharmacological applications of substances as these principles are a time-tested basis of drug indications and their mechanism of actions. Pharmacological basis of drug action revolves around the universal pharmacological principle that similar structures have similar pharmacological activity. Conversely, if the structure of a substance is known, then its pharmacological behavior can be inferred. Conventional pharmacology uses chemical structure as the basis for pharmacological basis of drug action. Ayurveda uses PañcamahābhŪta theory as the fundamental basis of drug action. Modern pharmacology evolves around a central axiom that the activity of a chemical is reflected in its chemical structure. A chemical structure includes molecular geometry, electronic structure and crystal structure of molecules. Molecular geometry refers to the spatial arrangement of atoms in a molecule and the chemical bonds that hold the atoms together. Molecular geometry can range from the very simple, such as diatomic oxygen or nitrogen molecules, to the very complex, such as protein or DNA molecules. Both qualitative and quantitative structure-activity relationship (QSAR) determines the biological activity of the substance and defines those alterations in structure that can change the overall properties of a compound. Combinatorial chemistry deals with QSAR that includes optimization of the lead compound, that is, modification of the functional groups of the lead compound. The modifications are carried out in order to improve its recognition, affinity and binding geometries of the pharmacophoric groups for the targeted site (a receptor or enzyme); its pharmacokinetics or its reactivity and stability toward metabolic degradation that are responsible for its ability to interact with a particular active site. By keeping R 1 and R 3 constant as OH and by modifying R 3 with various functional groups quite different, pharmacological properties are attained [Table 1]. Similarly, an increase in polarity increases negative inductive effect whereas a decrease in polarity results in a positive inductive effect [Image 1]. 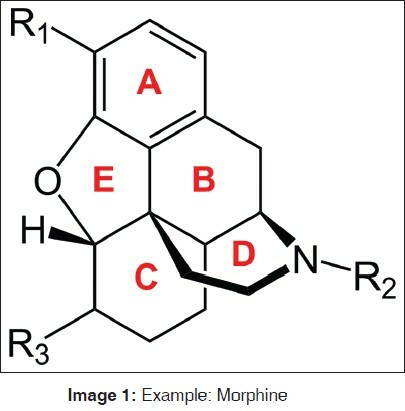 Drug discovery often involves the use of three-dimensional-QSAR to identify chemical structures that could have good inhibitory effects on specific targets and have low toxicity (nonspecific activity). Of special interest is the prediction of partition coefficient log P, which is an important measure used in identifying "drug-likeness" according to Lipinski's rule of five. While many QSAR analyses involve the interactions of a family of molecules with an enzyme or receptor binding site, QSAR can also be used to study the interactions between the structural domains of proteins. Protein-protein interactions can be quantitatively analyzed for structural variations resulted from site-directed mutagenesis. Rasa , roughly corresponds to "taste" in English. Ayurvedic pharmacology has the concept that helps exploring and verifying pharmacological behavior of a substance based on its rasa. Rasa is quite larger a concept than taste, where taste is only the first tool to enter into a larger concept. Caraka goes on to state that the rasa can be different in fresh condition and dry form of the same substance. Further, the same substance having different rasa in fresh and dry condition have different pharmacological properties in those conditions. For example, Piper longum Linn. is Madhura in fresh condition, whereas in dry form it is Katu and accordingly fresh P. longum is heavier to digest (guru) than dry P. longum which is easy to digest (laghu). Therefore, it is obvious that since rasa indicates the pharmacological behavior of the substance as and when the substance is presented before the user, rasa can be used as a tool to test the substance in use. Ayurveda uses four pramāṇas or fundamental tools to acquire and test knowledge, viz. āptopadeśa (textual evidence), pratyakṣa (knowledge acquired through one's own senses), anumāna (inference) and yukti (rational derivation). , Logically, these tools are also extended to assess and verify the pharmacological properties and actions of the substances. Āptopadeśa is the foremost tool of knowledge as these are time tested facts established after undergoing several verifications. But, pratyakṣa is the most important tool at the individual level in the absence of prior knowledge of the phenomenon. Pratyakṣa is the subjective knowledge perceived by the individual owing to an effective contact between ātma (the seat of knowledge), indriya (sensory organ), manas (mind) and artha (subject of the sensory organ) at the moment of this contact. Therefore, there can be five types of pratyakṣa knowledge perceived through five sensory organs. Thus, rasa (taste), which perceived through rasanendriya located at jihvā (tongue). Since pratyakṣa is an instantaneous knowledge before any application of analysis by the individual, it is an unbiased knowledge. Since unbiased observation is the foremost requirement of any scientific process, rasa is used as the first tool of drug discovery in Ayurveda. Secondly, among all indriyas (sensory organs), rasanendriya is the point where the substance undergoes significant chemical interaction with the body. This makes rasanendriya and its knowledge, rasa as the best available tool to suggest chemical picture of the substance. Since pharmacological behavior of the substance depends on the chemical picture of the substance, rasa can best reflect the pharmacological behavior of the substance. As will be further revealed, rasa indirectly indicates the pharamacological behavior of the substance but directly reflects the mahābhautika state of the substance. Thirdly, maximum of Ayurvedic medicines are administered through oral route, where the first point of interaction is the Tongue. It is logical to have a tool at the earliest point to assess the substance. Therefore, rasa has been preferred to other sensory organs in assessment and verification of pharmacological behavior of any substance. There are six primary rasas viz. madhura (sweet), amla (sour), lavaṇa (salty), kaṭu (hot), tikta (bitter) and kaṣaya (astringent). The concept of rasa in Ayurveda includes not only the sensory knowledge through taste buds but also the trigeminal senses. Each rasa indicates a distinct mahābhautika status of the substance. Each rasa signifies mahābhautika utkarṣatā of a combination of two mahābhŪtas. Although five mahābhŪtas can generate much more than six couplets of utkarshata, only six rasas are experienced because as Cakrpāni says mahābhŪtas combine with one another as per their inherent properties. Also six seasons influence cyclical predominance of six combinations of mahābhŪtas [Table 2]. But, the point to be remembered here is that these are only hypothetical derivations, and the final pharmacological behavior of the substance can only be determined after subjecting it to clinical trial. For developing the tool of biomarker for rasa, we have to go the fundamental level and establish humoral activity of PañcamahābhŪta individually and mutually. In-vitro study cannot always elicit exact and acceptable result. It is the authors' opinion that till date, not much work of this kind exists. But, an effort to build such framework is required. Because, rasa indicates the mahābhautika state of the substance at the commencing or initial stage of clinical use, but the body-substance interaction can logically throw up a different mahābhautika state in later stages. Secondly, the assessment of properties and actions on the basis of rasa indicates a potential range, but other pharmacological factors like specific affinity, antagonism, etc., also decides the final pharmacological behavior of the substance. All these suggest that rasa can be a scientific tool to assess or provisionally determine potential pharmacological behavior of any substance. In other words, rasa can indicate the possible pharmacological actions of a substance. This has been substantiated by relating the pharmacological activities of ibuprofen and oleocanthal to their similarities of taste. Both oleocanthal, from olive oil, and solutions of Ibuprofen, a nonsteroidal antiinflammatory drug, induce similar strong stinging sensation in the throat through trigeminal sensory pathway. Despite not being entirely similar structurally, both molecules are antiinflammatory and share similar profiles, being cyclooxygenase-1 (COX-1) and COX-2 inhibitors. This is one of the rare scientific reports noting common pharmacological activity for compounds with similar taste. , Further, it must be recognized that doṣa, bhŪta analysis of disease on one hand and the rasa, bhŪta analysis of the medicinal substances on the other is concerned with imbalances and their possible restoration. These have no analogies in modern medicine but bhŪta analysis can be used in recommending appropriate diet, medicines for a person, and have nothing to do with the concepts of modern drugs, and still bring the patient immense medical benefit. Rasa (taste) of a substance can be scientifically used to hypothesize its pharmacological behavior, which will reduce the time and cost in a drug discovery process as it can provide lead optimization. This can help intentional and focused search for safer and effective drugs. Trikamji AY. Dravyaguna Vijnananam. 7 th ed., Vol. I. Patna, Shri Baidyanath Ayurveda Bhavan Ltd.; 1983. p. 7. Bhushan P, Vaidya Ashok D.B, Chorghade M; Ayurveda and natural products discovery. Curr Sci 2004;86:789-99. Acharya YT, editor. Caraka Samhita with Ayurveda Dipika Commentary of Chakrapani Dutta. Sutra Sthana. Ch. 26. Verse no. 10. New Delhi, Rashtriya Samskrita Samsthan; 2006. p. 138. Acharya YT, editor. Caraka Samhita with Ayurveda Dipika Commentary of Chakrapani Dutta. Sutra Sthana. Ch. 26. Verse no. 11. New Delhi, Rashtriya Samskrita Samsthan; 2006. p. 138. Acharya YT, editor. Susuhruta Samhita with Nibandha Samgraha Commentary of Dalhana. Sutra Sthana. Ch. 26. Verse no. 10. New Delhi, Rashtriya Samskrita Samsthan; 2006. p. 138. Acharya YT, editor. Caraka Samhita with Ayurveda Dipika Commentary of Chakrapani Dutta. Sutra Sthana. Ch. 26. Verse no. 11, New DelhiRashtriya Samskrita Samsthan; 2006. p. 138. Acharya YT, editor. Caraka Samhita with Ayurveda Dipika Commentary of Chakrapani Dutta. Sutra Sthana. Ch. 1. Verse no. 64. New Delhi, Rashtriya Samskrita Samsthan; 2006. p. 18. Acharya YT, editor. Caraka Samhita with Ayurveda Dipika Commentary of Chakrapani Dutta. Sutra Sthana. Ch. 26. Verse no. 66. New Delhi, Rashtriya Samskrita Samsthan; 2006.p. 148. Acharya YT, editor. Caraka Samhita with Ayurveda Dipika Commentary of Chakrapani Dutta. ; Sutra Sthana. Chapter 26. Verse no. 28. New Delhi, Rashtriya Samskrita Samsthan; 2006.p. 141. Joshi K, Hankey A, Patwardhan B. Traditional phytochemistry: Identification of drug by 'taste'. Evid Based Complement Alternat Med 2007;4:145-8. Acharya YT, editor. Caraka Samhita with Ayurveda Dipika Commentary of Chakrapani Dutta. Sutra Sthana. Ch. 26. Verse no. 28. New Delhi, Rashtriya Samskrita Samsthan; 2006. p. 141. Acharya YT, editor. Caraka Samhita with Ayurveda Dipika Commentary of Chakrapani Dutta. Sutra Sthana. Ch. 27. Verse no. 297. New Delhi, Rashtriya Samskrita Samsthan; 2006.p. 170. Acharya YT, editor. Susuhruta Samhita with Nibandha Samgraha commentary of Dalhana. Sutra Sthana. Ch. 1., Verse no. 28. New Delhi Rashtriya Samskrita Samsthan; 2006. p. 03. Acharya YT, editor. Susuhruta Samhita with Nibandha Samgraha commentary of Dalhana. ; Sutra Sthana. Ch. 11. Verse no. 17. New Delhi Rashtriya Samskrita Samsthan; 2006.p. 70. Acharya YT, editor. Susuhruta Samhita with Nibandha Samgraha commentary of Dalhana. ; Vimana Sthana. Ch. 8. Verse no. 33. New Delhi Rashtriya Samskrita Samsthan; 2006.p. 267. Acharya YT, editor. Susuhruta Samhita with Nibandha Samgraha commentary of Dalhana. ; Vimana Sthana. Ch. 8. Verse no. 83. New Delhi Rashtriya Samskrita Samsthan; 2006.p. 274. Acharya YT, editor. Susuhruta Samhita with Nibandha Samgraha commentary of Dalhana. ; Sutra Sthana. Ch. 11. Verse no. 20. New Delhi Rashtriya Samskrita Samsthan; 2006.p. 71. Acharya YT, editor. Susuhruta Samhita with Nibandha Samgraha commentary of Dalhana. ; Sutra Sthana. Ch. 26. Verse no. 9. New Delhi Rashtriya Samskrita Samsthan; 2006.p. 136. Acharya YT, editor. Susuhruta Samhita with Nibandha Samgraha commentary of Dalhana. ; Sutra Sthana. Ch. 26. Verse no. 40. New Delhi Rashtriya Samskrita Samsthan; 2006.p. 143. Acharya YT, editor. Susuhruta Samhita with Nibandha Samgraha commentary of Dalhana. Sutra Sthana. Ch. 26. Verse no. 43. New Delhi Rashtriya Samskrita Samsthan; 2006.p. 144. Acharya YT, editor. Susuhruta Samhita with Nibandha Samgraha Commentary of Dalhana. Sutra Sthana. Ch. 46. Verse no. 514. New Delhi, Rashtriya Samskrita Samsthan; 2006. p. 514. Acharya YT, editor. Caraka Samhita with Ayurveda Dipika Commentary of Chakrapani Dutta. Sutra Sthana. Ch. 26. Verse no. 14-27. New Delhi,: Rashtriya Samskrita Samsthan; 2006. p. 139-40. Beauchamp GK, Keast RS, Morel D, Lin J, Pika J, Han Q, et al. Phytochemistry: Ibuprofen-like activity in extra-virgin olive oil. Nature 2005;437:45-6. 4 Taste of medicinal plants: A potential tool in predicting ethnopharmacological activities?